First let me say that from reading this book I can assume (based on comments that he made), that Will Bonsall and I are opposites in so very many ways, he lives up North and I live in the South, he is probably an atheist and I am a Christian, he’s probably a Democrat and I’m a Republican, he is a vegan and I am an omnivore, and yet, I found myself agreeing with him on so many gardening things. He asks some very thought provoking questions like “How local is a fruit or vegetable really when the seeds, fertilizers, compost and pest management products are shipped in from all over to grow the ‘local’ produce.” These are things I think about and never realized that other people thought them too. And yet, these are the kinds of questions we should be asking. One of the things I loved about this book is that Will Bonsall does not talk down or demonize anyone for doing things differently or making different choices. He does not raise animals and has quite a compelling argument for not raising them, however he never says you shouldn’t raise animals. In fact, he talks about how to make sure you’re using all that the animal produces if you choose to raise animals. He also isn’t arrogant or self-righteous in his writing. He shares areas that he could become more self-reliant so that you don’t get the impression he’s doing something he’s not. I really liked the honesty. As I’m reading the book, I feel like I’m just chatting with a neighbor and learning. The book covers composting, green manures, mulch, minerals, grasslands, propagation, growing vegetables, grains, pulses, oilseeds and permacrops. 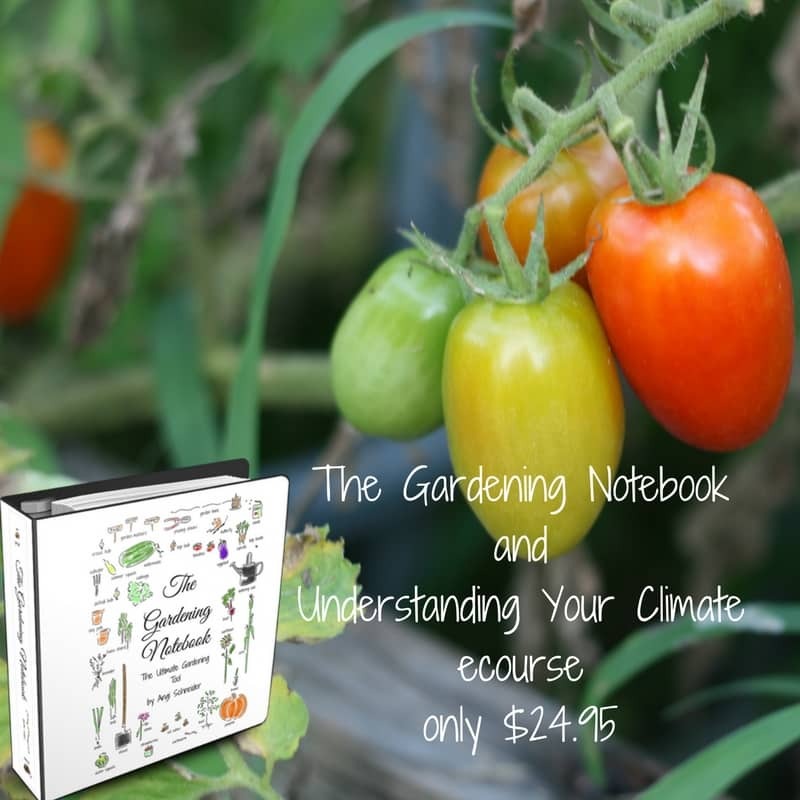 There is also a section on managing the actual garden in relation to the rest of the property and a section on using the harvest. There is so much to this book. I rarely say that a book is good for everyone but this is one that I think every gardener should read. If you are pretty conservative and easily offended you might want to check this out from the library first to make sure you can get pasted some of the comments. I just took them as joking around but I had a friend take them seriously and not care for the book because of that. So I feel a need to mention it. 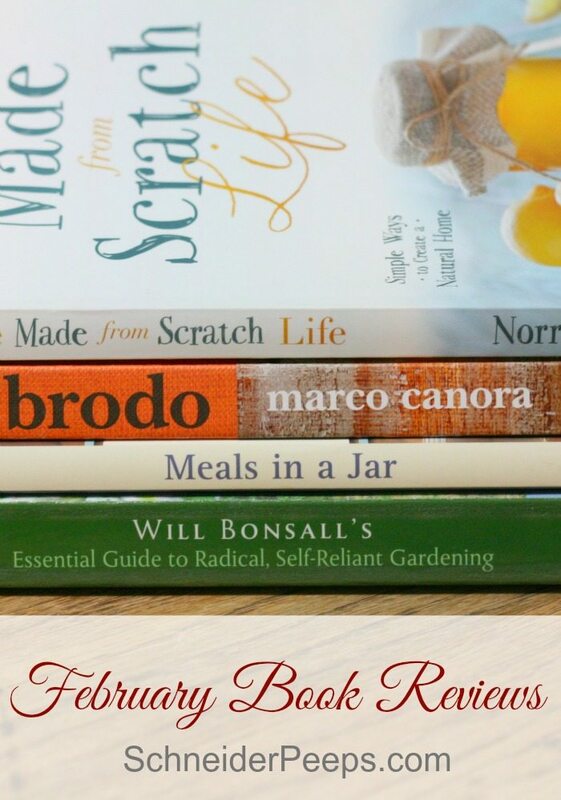 The Made From Scratch Life by Melissa K. Norris is most definitely a Christian book. If you are familiar with Melissa’s blog or podcast you know she weaves Christ into everything she does…and that includes gardening, cooking and writing. When I found out that Melissa was writing a book I begged asked nicely if I could have a review copy. I was so happy when her publisher sent me a paperback book in the mail. This book has not disappointed me. 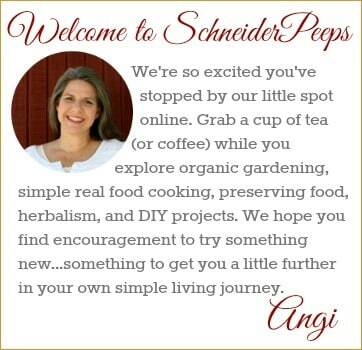 It’s part devotional, part homesteading and part recipes. The devotional part is at the beginning of each chapter – these stories tell why Melissa is so keen on sharing these things she has learned. 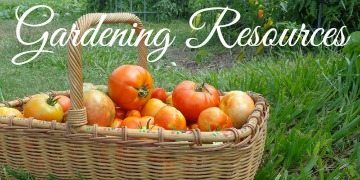 The homesteading part is in the gardening, preserving and livestock chapters. And the recipes are in the cooking, cleaning and preparing chapters. Let me share with you a few of the recipes, there is applesauce, fruit leather, pickled asparagus, caramel frosting, hillbilly beans, tortillas, gluten-free bread, laundry detergent and face moisturizer. There is definitely a variety. The only thing I wish this book had that it doesn’t is photos. I’m a sucker for beautiful photos. But I think this was intentional in order to keep the price down. The regular price is just $13 and right now it’s on Amazon for $10. I think this book is ideal for the person who is beginning to make the switch from purchasing everything already made to making their food, toiletries and cleaning products themselves but is finding it overwhelming. I think this book has enough variety to get you started without overwhelming you. 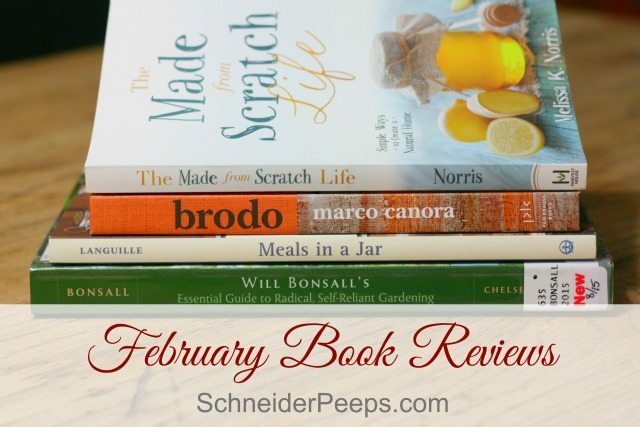 Brodo: A Bone Broth Book by Marco Canoa is a book I got from Blogging for Book for reviewing. I know, a whole book bone broth? Yes, and it is really a great book. Of course, I already know how to make broth but I always feel like something is missing. My broth is fine for adding into soups, pastas and rice dishes but no one really wants to just drink it by itself. And yet, I hear that other moms make broth so amazing that their family craves it. So yeah, I picked a book on making bone broth to review. First of all, Marco Canoa has a whole business named Brodo which sells broth in New York City – it’s kind of like a Broth Bar. People walk up to the window, order broth and stir ins and leave with a warm cup of nutritious deliciousness. That’s the kind of broth I want to learn to make for my family. The first part of the book is about the health benefits of drinking broth and tips for making broth at home. The second part of the book is the recipes. There are recipes for making chicken, beef, pork, lamb, duck, fish, mushroom, vegetable and hearth broth which is turkey, chicken and beef combined. There are also recipes for using these broths in other dishes and ideas for add-ins for the plain broths. After reading this book, I’m inspired to try a few new things in my broth making. We order our meat every other month from a local farm. They sell soup bones but I’ve never bought them before because I wasn’t really sure how to make a really good broth. Next time we order meat, soup bones will be on the order also. This is a great one to check out from the library first as it’s a little on the pricey side – but it does have great photos ;-). A friend gave me Meals in a Jar – Quick and Easy, Just-Add-Water, Homemade Recipes by Julie Languille. Now, she didn’t buy this book for me, she bought it for herself but after looking through it decided that I might get more use from it. As you can see from the cover, it looks like you put dried food in jars and then (according to the subtitle) just add water to make a meal. However, there doesn’t appear to be any water in any of the jars on the cover. But the book is full of all kinds of pressure canned and vacuumed sealed meals, not things most “normal” people have. I’m not sure why the publishing company chose to put this very conventional cover on a prepping book. Because that’s what this book is, in fact, it’s even listed on the publisher’s website in the prepping genre. When I look at this book from a prepping viewpoint, it’s a very good book. There are a lot of recipes and systems to fill your pantry. There is some good information on canning but they do suggest canning some things that I’m a little uncomfortable with….like butter. The quantities are big, so you probably want to make a sample meal first to make sure your family likes it. There were several recipes that I thought looked really good and I have plans to try them. The idea behind the large quantities is that you are making meals to fill your pantry and then you rotate through those meals. So, instead of buying a box of macaroni and cheese each week at the grocery store, you make 25 and store them in your pantry and use them over a course of 25 weeks. Some of the “recipes” had me wondering if they were just trying to fill extra pages. One recipe was to make popcorn packets. Basically, you take a cup of popcorn and a teaspoon of salt, put it in a vacuum seal bag and seal it. I’m not real sure how that saves much time. It doesn’t take any longer to just put those two things in a pan to make the popcorn when you want popcorn rather than making a bunch of bags ahead of time. In fact, it might be quicker since you don’t have to use the vacuum sealer. If you are interesting in prepping and don’t want to buy a bunch of prepackaged food, this book is definitely worth checking out from your library and seeing if it’s something you’d want to buy to refer back to.